Lausanne (SUI), 20 March 2014 – The FEI has signed a cooperation agreement with the National Reining Horse Association (NRHA) and the American Quarter Horse Association (AQHA), formalising the FEI’s relationship with the NRHA and AQHA that has been in place since Reining became an FEI discipline in 2002. “Since Reining became an FEI discipline in 2002, we have worked closely with the NRHA and AQHA to grow the sport worldwide, and the expansion has been huge, with 115 Reining events last year compared to just five in 2002,” said Bettina de Rham, FEI Director Reining, Driving & Vaulting. The NRHA, based in Oklahoma City (USA), was formed in 1966 and brings together over 19,000 members, including 1,400 youngsters. “The NRHA is very excited to be moving forward with its relationship with the FEI, and to growing the sport of Reining worldwide,” said Beth Himes, NRHA President. 2012 NRHA Futurity Level 4 Open Champion Americasnextgunmodel and Casey Deary ©Alden Corrigan for Equestrian Life. Equestrian Life is pleased to bring our members exclusive behind-the-scenes access to the 2013 NRHA Futurity Championship Show and the $75,000 Added Open World Championship Shootout Thursday, December 5th through Saturday, December 7th. You’ll feel like you’re right at the rail with us as the world’s top Reining horse and rider combinations compete for the coveted titles and huge prize money up for grabs in Oklahoma City. Our cameras will capture it all, from today’s superstars of the show pen to tomorrow’s elite athletes offered in the NRHA/Markel Insurance Futurity Prospect Sale, as well as the not to be missed Reining Horse Sports Foundation (RHSF) Slide to Remember featuring celebrity guests, representatives of the NRHA Hall of Fame, crossover riders from other equestrian disciplines and Freestyle Reiners. To view the NRHA Open Futurity Finals and $75,000 Added Open World Championship Shootout Photo Gallery daily, please go to: www.equestrianlife.com/eventgallery/2013_NRHA_Futurity_Championship_Show/. Fairfield, Connecticut – April 2, 2012 – The Intercollegiate Horse Show Association (IHSA) is proud to announce that the National Reining Horse Association (NRHA) embraced its role as official sponsor for the IHSA Western Semi-Finals, leading up to the 2012 IHSA National Championships, May 3-6, at the Hunt Horse Complex of the NC State Fairgrounds in Raleigh. Oklahoma City, OK – The 2011 National Reining Horse Association (NRHA) $540,000-added Open Futurity finals was held at the NRHA Futurity & Adequan North American Affiliate Championship (NAAC) Show at the Oklahoma State Fair Park in Oklahoma City, Oklahoma. This year’s riders were mounted on world-class reining horses all aiming for the $150,000 championship purse and their share of NRHA Corporate Partner and Futurity Sponsor awards. 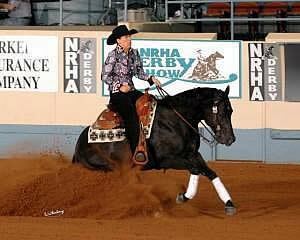 The NRHA Futurity saw a massive increase in added money due to the NRHA Nomination Program. According to NRHA Chief Financial Officer John Foy, with the addition of the North American Nomination Program’s added monies, there was an increase of more than $600,000 in added money with over $420,000 in the NRHA Open Futurity and $180,000 in the Cinch NRHA Non Pro Futurity. The total purse for just the Futurity is projected to be more than $1.9 million (a 25%+ increase). Nominators are projected to collect almost $100,000 – even if they don’t own the horse! Oklahoma City, OK – The international sport of Reining will host the world’s premier event for reiners – the 2011 NRHA Futurity & Adequan North American Affiliate Championship (NAAC) Show November 24 through December 3 at Oklahoma State Fair Park in Oklahoma City. This year’s event will be the 25th to be held in Oklahoma City. Oklahoma City, OK – Members of the National Reining Horse Youth Association (NRHyA) are the future of the sport of Reining. With this in mind, the Reining Horse Sports Foundation (RHSF) has long been committed to providing leadership and scholarship opportunities to youth members. At this time the RHSF is awarding $10,500 in academic and need based scholarships for seven youth members. Youth members from the United States and Canada submitted applications for the RHSF Scholarships in 2011. Recipients were determined by a committee based on academic achievement, future goals, involvement in NRHyA and NRHA, and financial need. 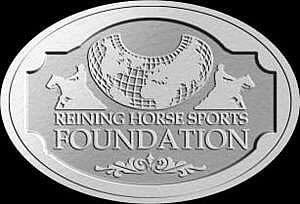 “The RHSF scholarship program is the perfect way to contribute to the future leaders of the reining industry. NRHyA is fortunate to work with such an outstanding group of young adults, and we look forward to watching the scholarship recipients’ future successes unfold,” said Shianne Megel, Supervisor of the RHSF & Youth Programs. Christine Gordon of Colorado, Helen Lauth of Minnesota, and Samantha Belcher of Colorado were each awarded $2,000 in RHSF scholarship monies. Gordon attends Colorado Christian University and majors in music and math. Lauth will return to South Dakota State University as a member of their equestrian team, majoring in park & recreation management. Belcher plans to attend the University of Georgia where she will continue to compete in Reining as a member of their equestrian team. Oklahoma City, OK – Twelve college-age riders competed in the 2011 National Reining Horse Association (NRHA) Collegiate Reining Championship during the recent NRHA Derby Show in Oklahoma City, OK. Jesse Gentile of The Ohio State University won the championship title and NRHA Lawson trophy with a score of 218. When asked what advice he would give young reiners, Gentile who rode Out Dun the Son from Gary Sanders of Steele, MO, said, “Have fun, and even though it’s (reining) is a lot of work, it is worth it.” Paige Monfore of Auburn University, who rode Dunit Pistol Pete from Katheen Ray of Aubrey, TX, and Mckenzie Lantz of the University of Georgia who rode Playgun Chic Olena from Teresa Wynn of Benton, KY, tied for reserve with scores of 215.5. 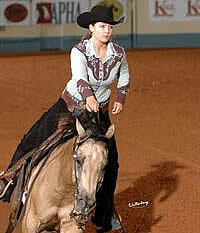 NRHA selected four riders from a pool of collegiate NRHA members to participate in the championship. The individuals who competed on behalf of NRHA are Jenna Blumer, Oklahoma State University; Jesse Gentile, The Ohio State University; McKenzie Lantz, University of Georgia; and Austin Griffith, The Ohio State University. Four individuals were selected to represent NCAA Varsity Equestrian competitors in the class. The riders selected to compete on behalf of Varsity Equestrian were: Page Monfore, Auburn University; Rachel Houchin, Oklahoma State University; Kristen Hansen, Auburn University; Becca Haaland, University of Georgia. Layla Choate winning the inaugural NRHA Interscholastic Reining Championship aboard Kathleen Ray’s Dunit Pistol Pete (Photo by Waltenberry). 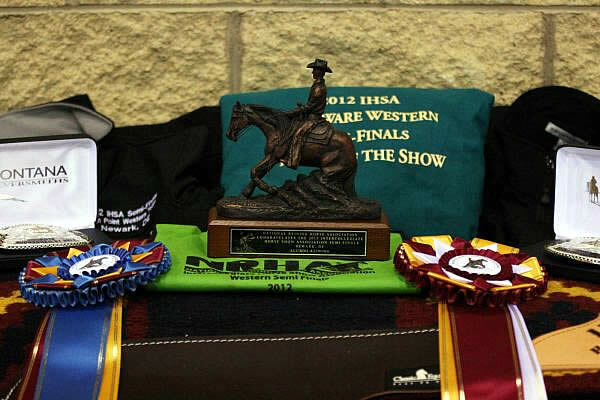 Oklahoma City, OK – The National Reining Horse Association (NRHA) welcomed Interscholastic Equestrian Association (IEA) competitors to the National Reining Horse Association (NRHA) Derby Show on June 30, 2011. Competitors were given an opportunity to participate the first-ever NRHA Interscholastic Reining Championship, a competition similar to the long-standing NRHA Collegiate Championship. The new championship class brought together the top four riders from the Individual Open Reining at the IEA National Western Championship and the top four riders from the 2010 NRHA Youth 14-18 division in an exciting competition where the youth will show unfamiliar horses donated by generous supporters. Layla Choate of Hazel, Ky. and Dunit Pistol Pete (donated by Kathleen Ray of Aubrey, Tex. ), earned the first Interscholastic Championship title with a score of 217.5. Megan Foley of the Autumn Rose Equestrian Team in Powell, Ohio, rode Check This Dun It (donated by Lorrie & Terry Thrasher) and was awarded Reserve Champion with a score of 217. Choate will be attending the University of South Carolina in the fall where she will be majoring in environmental science. Choate offered advice to young riders by saying, “Work hard every day and ride as many different horses as you can.“ She said that by doing so you will improve yourself as a showman. Oklahoma City, OK – Michael Pope’s 7-year-old horse, Whizota, “tried his heart out” and that determination edged the pair over their competitors into first place. Pope, Elizabeth Cosper and Olivia Hartman were crowned USEF National Youth Reining champions of three separate age groups at Saturday’s 2011 National Reining Horse Association (NRHA) Derby. The Youth qualified for the USEF Championships by earning points in Qualifying Classes throughout the country in 2010-2011. Pope, a 21-year-old from Theodore, AL, won the 19-21 age division on a score of 141 over Pilot Point, TX-rider Breanne Bertrand, who took the reserve spot on Stoned Chick on 140. Pope also claimed the third-place position, riding Whizn Freckle on a score of 139.5. Pope’s victory is just the latest in a long string of accomplishments that include: showing at all three NRHA Non Pro levels and leading the nation in USEF Youth 19-21 division and Adult Amateur division; 2009 Mississippi Reining Horse Association Year-End Champion Youth 14-18; 2008 Mississippi Reining Horse Association Year-End Reserve Champion Youth 14-18; 2005-2007 Mississippi Reining Horse Association Year-End Champion Youth 14-18; 2009 Year-End Champion Novice Horse Non Pro Level 2; and 2009 Year-End Reserve Champion Novice Horse Non Pro Level 1.